Below are some famous quotes by Confucius, the Chinese philosopher who founded Confucianism. Please note, that as Confucius of course wrote in Chinsese, quotations have been translated into English - but alternate translations exist as well. "Isn't it a pleasure to study and practice what you have learned?" "Be loyal and trustworthy. Do not befriend anyone who is lower than youself in this regard. When making a mistake, do not be afraid to correct it." "If a man has no humaneness what can his propriety be like? If a man has no humaneness what can his happiness be like?" "When I walk along with two others, from at least one I will be able to learn.."
"The virtuous is frank and open; the non-virtuous is secretive and worrying." "A young man should serve his parents at home and be respectful to elders outside his home. He should be earnest and truthful, loving all, but become intimate with humaneness. After doing this, if he has energy to spare, he can study literature and the arts." "The superior man, when resting in safety, does not forget that danger may come. When in a state of security he does not forget the possibility of ruin." "The superior man governs men, according to their nature, with what is proper to them, and as soon as they change what is wrong, he stops." "Sincerity is the way of Heaven. The attainment of sincerity is the way of men." "In all things success depends on previous preparation, and without such previous preparation there is sure to be failure." 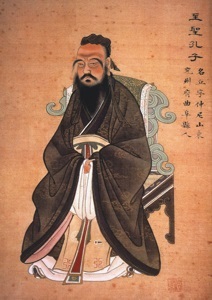 Much of Confucius's writing survives to the present day, so there are of course many other sentences and writings that could be quoted as well. - This quotation is actual from the Tao Te Ching, Chapter 64, written by the Chinese philosopher, Laozi, who is usually credited with being the creator of Taoism. "Life is really simple but we insist on making it complicated." - This quotation is widely attributed on the Internet to Confucius, however, according to Wikiquote, he is not the source.